This page does not include all official rules. Go here for a complete copy of official rules for the PAC-MAN® Promotion. When you enter the 2nd chance drawing or play the PAC-MAN® bonus online game for prizes, you will be asked to sign in with your MyGameRoom account. Go to valottery.com to get your free account if you don’t already have one. 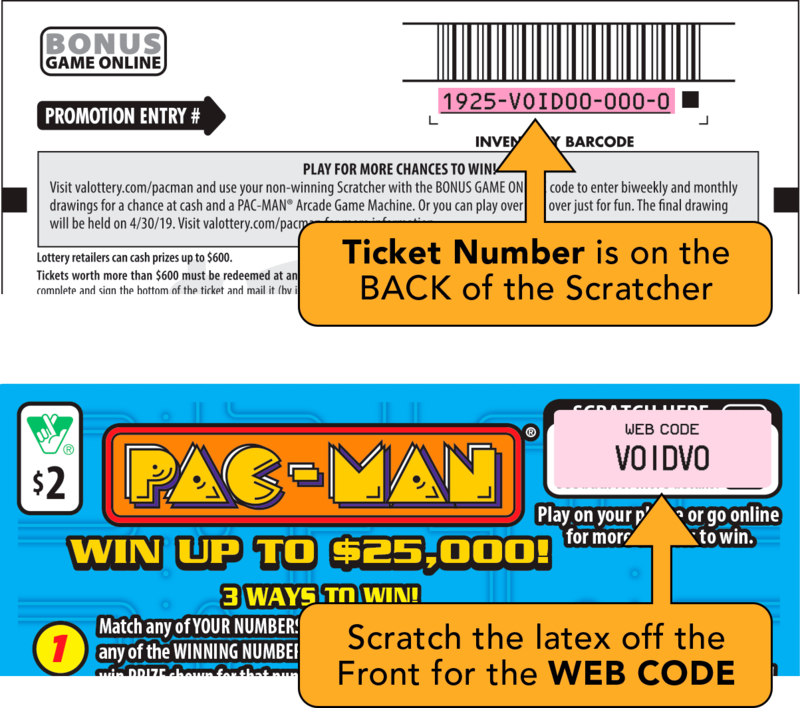 After successfully logging in to the PAC-MAN® game, you will be prompted to enter the BONUS WEB CODE found on the upper right of the front and the Promotion Entry Number found on the back of your non-winning PAC-MAN® Scratcher. Only non-winning PAC-MAN® Scratchers are eligible for a play for prizes game. Each valid non-winning PAC-MAN® Scratcher will give one entry into the drawing. Players must select the CHAMPIONSHIP MODE to play the game for prizes. The outcome of each PAC-MAN® Game is not pre-determined and is dependent on the actions made by the participant during the game. The Leaderboard will display the top ten (10) scores only. A participant’s highest score is taken and placed on the Leaderboard. A participant’s score can only be placed on the Leaderboard once in a week. A participant is eligible to win each of the 1st, 2nd and 3rd prizes only once over the course of the promotion. For this promotion, you do not need to keep your non-winning Scratcher after a successful entry. You can only enter twenty-five (25) non-winning PAC-MAN® Scratchers within a 24-hour period. Prizes will be available until all allocated prizes have been awarded or the PAC-MAN® Scratcher is longer available for purchase in Virginia Lottery retail locations. For a complete list of all prizes available, tap or click on the Prizes page.